With my new found skill for crocheting small things around a baby, I wasted no time in looking for a suitable first project. With autumn well under way and winter drawing in, my thoughts turned to slippers. Specifically I was thinking how cold my own feet get during the winter months and how cotton socks just don't cut it in terms of keeping my toes toasty warm. 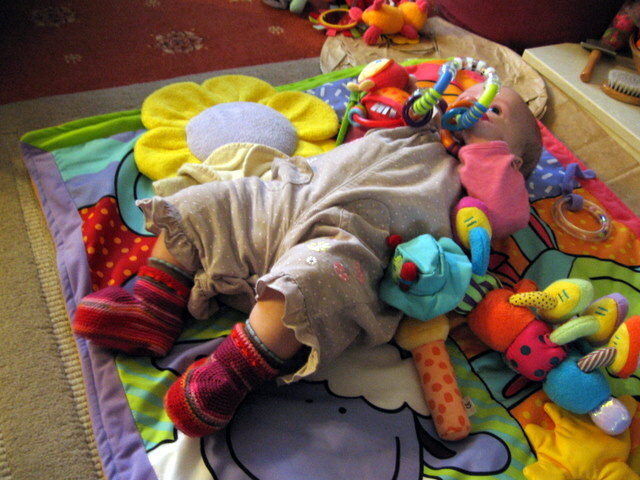 So the search was on for baby slippers that could be worn over cotton socks both indoors and outside. M doesn't need much in the way of a sole since she is a long way off walking, let alone running about outside, hence providing the slipper is substantial enough it should do for outside use. I don't have much experience with babies in general, but in M's case she is a very enthusiastic foot kicker. For any slipper to have a chance of staying put it would need to have a cuff around the ankle... And so what I obviously needed were booties. 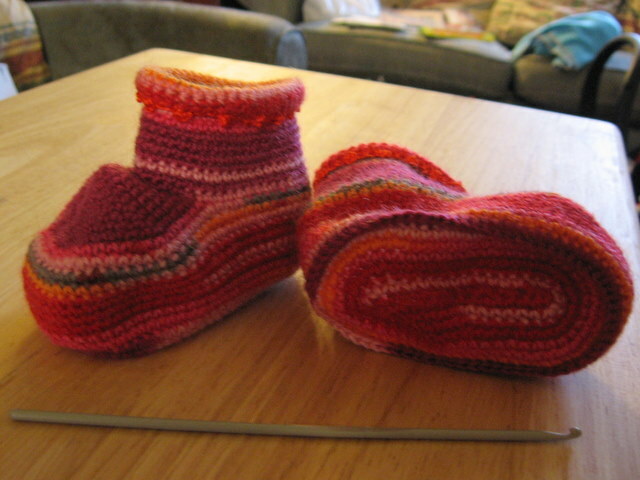 After a trawl through Ravelry's pattern database I eventually settled on Little Feet (Ravelry Link) by Joana Nossa. Little Feet are worked in a spiral, starting on top of the foot and then extending around the heel before working down towards the sole. The yarn is cut and rejoined to work the cuff, while the sole is made separately then attached to the body of the shoe. The bootie is finished off with a picot edging around the cuff. The result is a rather robust looking bootie. 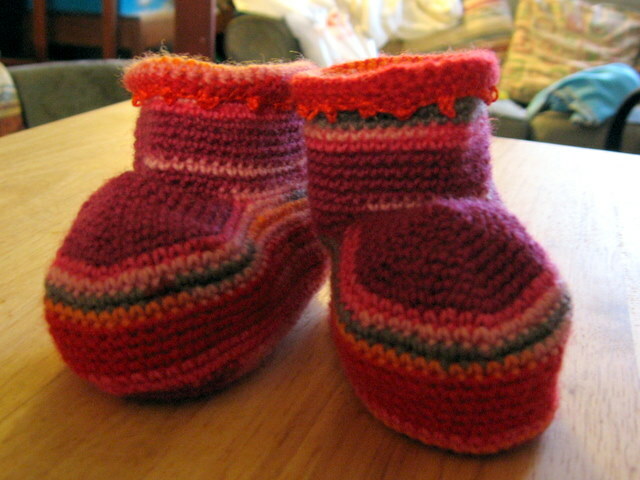 M's feet are not that big and didn't need a huge amount of yarn so I made these booties using left over sock yarn. The yarn in this case was originally used for my very first pair of socks. It's a standard Regia 4 ply, 75% wool and machine washable - so should be very cosy and fairly durable. Being the left over yarn from another project, I can only estimate but would say I used approximately half a ball or 25g to make both booties. I don't have the ball band so don't have details of the colourway but it's made up of eye catching reds, pinks, orange and grey; very cheery and I love the way the colours work together. That the colours match a little on both booties is a happy consequence of having tried to match them up on the original pair of socks. Since I was using the remnants of two 50g balls, each had ended in a similar place in the colour striping which is why these two booties look similar. Finish as per pattern and add picot edging. This gave me a bootie to fit a foot approx 11cm long which will hopefully mean there is a little growing room while not being too big for my 16 week old baby. The overall result is a striking, colourful bootie which I'm hoping will stay on despite vigorous foot and leg kicking on the part of M.
Initial tests suggest they'll do nicely and here you can see them in action. 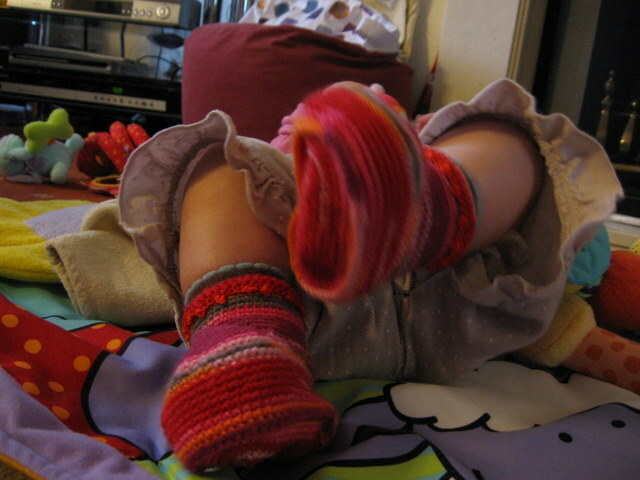 This is the first time I've tried to photograph knitware on a baby and it is more difficult than I thought it would be. M, bless her, loves waving her feet especially when excited (and who wouldn't be excited by a pair of crocheted slippers? ), hence most of the shots I took came out very blurry. These were the best of the lot so hopefully they do the booties justice. I thoroughly enjoyed making these booties. The pattern was a little difficult to read but the pictures showing the construction helped a lot. Since I was resizing, it was more important that I understood how to put the shoe together than following the pattern exactly as written. My notes reflect the style of the original pattern which they're intended to compliment. I would certainly give these booties another go, sizing up again as needed. All in all, a fun, quick and importantly small project.